If Sydney is going to become a more sustainable city that reduces its reliance on the private motor car, then great taxi services are a must. Let’s be honest – trains and buses can get you so far but don’t take you everywhere you need to go (and not everyone can easily access them). That means being able to easily hail or call a taxi, particularly for shorter local trips. Until now, dealing with taxi drivers and companies in this city has often been a frustrating experience. Everyone has their stories of taxis that don’t turn up in times of crisis – threatening that plane flight or crucial business meeting. When you make repeat calls to taxi companies trying to find out what is going on, you are usually given the immortal and not particularly helpful line of “first available” or “the driver is on his way”. You may as well be told: “The water is wet”. Or, as is often the case, wait for the second coming. That is why the new taxi apps are more than just another piece of pointless technology. They are, in fact, potentially a city changing tool. 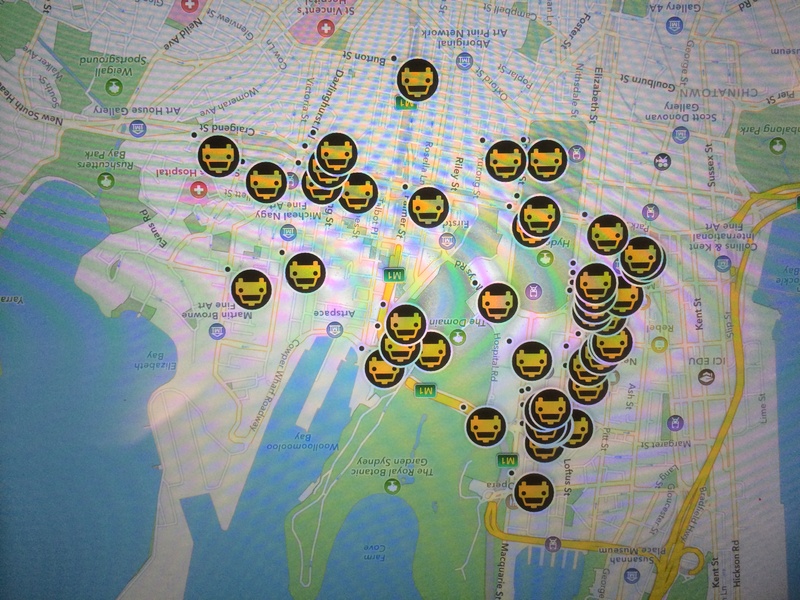 The taxi app I use (GoCatch) allows me to see on a map how many drivers are prowling around the local area (based on the GPS signals from their mobile phones). I can then announce my job to the local drivers and, if necessary, give a tip to lure one to them (by the way, I’ve never had to do this). I can then see how many drivers are aware of my job and when it is accepted. Most importantly, I can also see a map showing the driver starting to head towards me. Even if the driver takes a little longer than expected, it doesn’t bother me. I can see the driver coming towards me on my Ipad and therefore know I am going to be picked up – which was never the case with the telephone service. I can even call the driver to get the latest info – and the driver can also call me. Again – this is not possible with the telephone service. I can also rate the performance of the driver and other people can see this rating as the drivers prowls the streets – encouraging good behaviour. It is the ultimate empowerment of both driver and passenger. What’s best of all is that the job is treated as a “hail” job – in other words it is assumed that I walked out the front of my home and hailed it on the street – so I don’t have to pay an extra fee. This is a nice piece of “legal fiction”. All this means that people may be more likely to give up their cars and plough the tens of thousands of dollars saved through the car’s purchase, maintenance, registration and insurance into buying individual taxi trips – therefore reducing reliance on additional private vehicles which take up lots of parking space in our city. And most taxis run of liquid gas, which burns less carbon emissions than petrol or diesel fuel commonly used by cars. My main criticism of the system appears to be that it seems to rely on drivers monitoring their mobile while driving which could be a safety risk. The other issue which has arisen in the media is that drivers are able to obtain passenger’s mobile phone number – which can be a privacy risk. In one case, a driver apparently sent abusive text messages to a customer. However, overall, there seems to be far more positive than negative in regard to this technology and it is good to see the NSW Government has introduced a bill into Parliament which regulates and supports the use of taxi apps and creates a level playing field for all.